Hanukkah celebrates the victory of the Maccabees over the oppressive Seleucids (Syrian-Greeks) who were one of the mightiest armies of the time and who tried to force the people of Israel to deny their religion. The Maccabees reclaimed and rededicated the Holy Temple, where they sought to light the Temple menorah (candelabra). The miracle of a small amount of oil being able to provide light for eight days instead of the one day it was supposed to last is also a main point of celebration for the festival. Seeing as Christmas and Hanukkah are celebrated around the same time every year, we thought we’d take a moment to think about what they have in common. Hanukkah starts on a different date each year due to the Jewish calendar being a lunar one, but it almost always takes place in December. With Christmas marked on 25th of December, they tend to share the winter month celebrations. Christmas decorations tend to involve the use of different lights, such as fairy lights on the tree, or lit-up reindeer on the roof. Hanukkah is known as the Festival of Lights due to the miraculous menorah lighting. 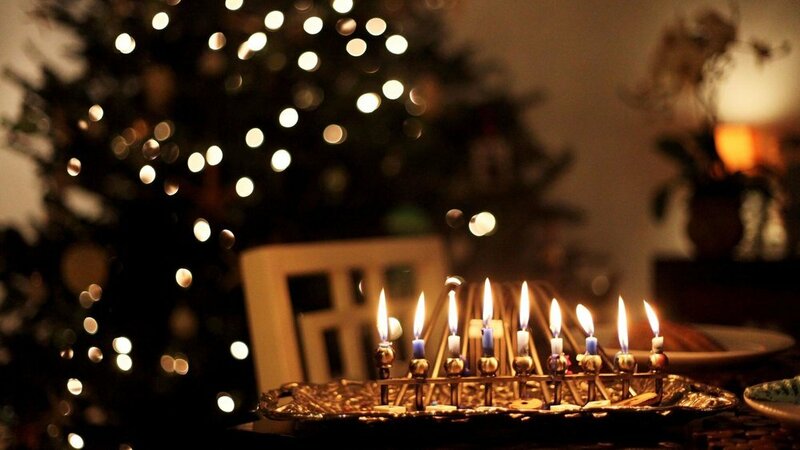 Families will light their own Hanukkah menorah for each of the eight nights. A main theme of the festival is to chase away darkness with light. Both festivals highlight the importance of gathering as a family and spending time together. The giving of gifts on Christmas is a long-time tradition that delights children as well as adults. Gifts are not a traditional part of Hanukkah, but many Jews began adopting the practice from the mid twentieth century, influenced by the prevalent Christian norm during the same period. Many parents enjoy giving chocolate coins to their children during Christmas. This is also prevalent with Jewish families for Hanukkah. It is traditional to give children “gelt” – money, but one can often find it is chocolate money in more recent years. The idea of giving gelt for Hanukkah is to teach children about giving to charity by sharing their money with the less fortunate. The Christmas period is known too for a time to be charitable and to reach out to those who might need help. Lastly, both festivals are an opportunity to indulge in festive food. Christmas dinner would involve turkey and an elaborate roast, with mince pies and Christmas pudding at the end. Having a connection to oil, Hanukkah has several traditional fried treats to enjoy such as latkes (potato pancakes) and sufganiyot (jelly doughnuts). Comparing these two festivals, it's easy enough to see that despite being from different faiths and origins, they have quite a lot in common. Whichever you celebrate, whether you celebrate at all, we at Near Neighbours would like to wish you a happy and healthy new year.